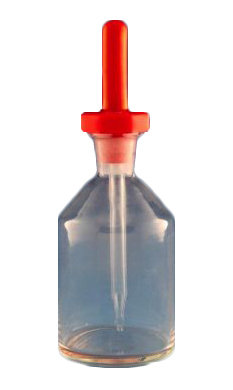 Clear glass dropper bottle made from soda lime glass - ideal for storing extracts and flavours to add to dishes. Also ideal for use when adding liquid/puree final details to a dish when plating. Please note that this bottle does not come with a dropper, only a plastic stopper. Please note - image is of smaller 50ml version. The bottle is made from soda lime glass so should not be heated above 100C or used with very cold liquids like Nitrogen.